Darko Brevic is a character in the HD Universe who appears in Grand Theft Auto IV. 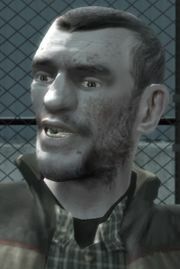 Darko had sold out his squad during the Yugoslav Wars, and one of only three surviving members of the squad along with Niko Bellic and Florian Cravic. Darko was a fellow soldier alongside Niko Bellic and Florian Cravic during the Yugoslav wars, and eventually sold out his squad (to enemy forces) for $1,000 to help pay for his heroin addiction. The only two people to survive the ambush, apart from Darko himself, were Niko and Florian. Niko would spend the next decade hunting down Florian and Darko to discover who committed the betrayal, and to exact revenge. After the betrayal, Darko fled to Bucharest, Romania. Niko moves to Liberty City to find Florian, who in the intervening years changed his name to Bernie Crane. Niko discovers, however, that Florian is innocent, and begins to look for Darko. One of Niko's contacts at the United Liberty Paper organization eventually arranges Darko's kidnapping, and leaves him on the tarmac of Francis International Airport, at Niko's mercy; Niko arrives at the airport with Roman, and interrogates Darko. Darko reminds Niko that their squad were no angels themselves, stating that Goran (another member of their squad) was responsible for the deaths of some of Darko's own friends and neighbours, and tells Niko the reason he betrayed the group. Niko is horrified that he and his friends were sold out over such a paltry sum of money; in response, Darko asks how much Niko has charged for all the murders he has committed. Darko also calls him a hypocrite; he falls to his knees and says that Niko would be doing him a favor by killing him. He breaks down in tears, and Roman attempts to coax Niko away, observing that Darko "doesn't look like he enjoys life too much." The player can then decide whether to kill or spare Darko. Should the player choose to kill Darko, Niko will shoot him twelve times, one shot for each of his lost friends. Darko thanks Niko as he dies, and Niko walks away feeling, as he later says to Roman, "empty". If Darko is spared, Niko will feel a little better, knowing that the greater punishment is leaving Darko alive to suffer from his drug addiction. As Niko walks away, Darko runs away screaming, never to be seen again in the game. Darko sold out his fifteen man squad, and is considered responsible for their deaths. He bears a small resemblance to Niko, holding distinctly similar facial features and hairstyle. If the player executes Darko with a Desert Eagle, which only holds 9 bullets, Niko will still fire 12 shots without reloading. If the player lets Darko live, he runs away. If followed, he runs about the airport forever without running out of breath or stopping. Crashing into or shooting him will immediately change the conversation between Niko and Roman. If the player beats him up, Roman will beat him up and even kill him. The game then acts as if Niko killed Darko. When killing Darko, after firing 12 bullets Niko will reload his Pistol, even though it has a 17 round capacity. This only works with the Glock 22 style Pistol. This page was last modified on 30 April 2014, at 06:05.